As suggested from another thread here I have been looking at the possibility of a simple modification to change the "Active Humbuckers" (and yes they are definitely active) into good old organic passive affairs. I have stripped out the active PCB (Printed Circuit Board) from my Pre-Refined Fly Deluxe, now this thread will deal ONLY with the early revision 1 version of the Fly, mine is a 2002 so if you have a newer Rev2 Fly look away now!! My first dissapointment was to learn that the PCB is loaded with SMD (Surface Mount Devices) like in your cell phones guys, these not only make the operation quite difficult but for some almost impossibe to perform the mods, but all is not lost if you have a good guitar tech ready to take on this mod, it is not that difficult, just fiddly and a little time consuming. So guys who here can use a soldering iron? who can reconise a circuit diagram (schematic) component symbol? who has a nervous condition? On this PCB you will need to cut some tracks, these are the small copper links between the components, and cutting them will remove the active section of the HB's but NOT the Piezo, so here is where I need my first vote from the members here, should we fit a mini toggle switch to select between "Active" and "Passive" HB mode? let's have some ideas of where this switch should/could be located if you feel this option is necessary, so this is the start, need some input straight away. Don't wait for it to happen ! I want Passive humbuckers and active piezo. I don't need a combination of the two and I don't see any reason to use the humbuckers active once they are passive. My two cents. 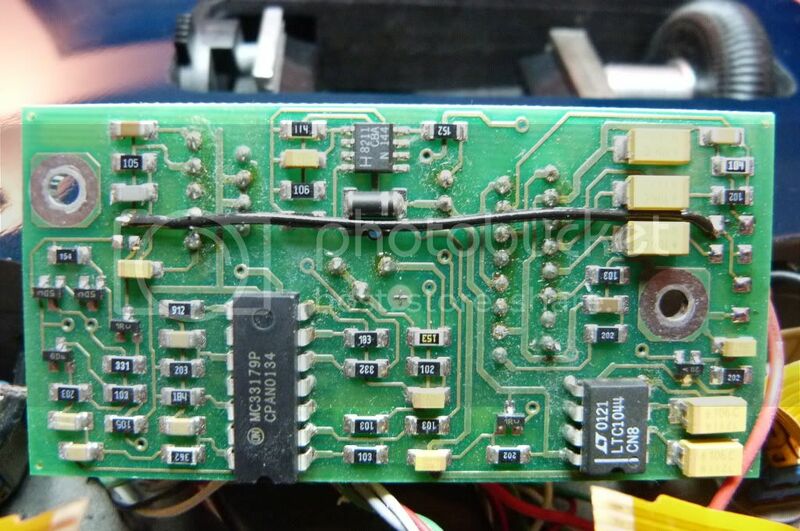 I can recognize a circuit diagram... pics like in your post are probably best though for most here. Would love to offer suggestions. I've cut traces, replaced SMD components, (BGA, 0201s, QFPs, etc) for military communications equipment. I'm a little out of practice but was considered an expert during my electronics mfg days. Wish I had more time to really dig in and trace the circuit through, as I wasn't sure if this approach would disrupt the switching or not. Removing a resistor or cap in line with the trace should also remove the need to cut the trace, unless there's something in parallel. That said, you would probably want to cut the trace from the pin in question just to be sure. If done carefully, this mod could be easily reversed and need not be permanent. I probably would not bother with a switch, either you like the active mags or you don't. If I was doing this, I'd put a small rocker switch on the backplate, flushmounted so the pad of your finger would switch it, but it wouldn't do it accidentally. The guitar would still look stock from the front. You could put quick connect's on the wires (you're going to want to do that on the battery wires anyway). Just my $.02. OK so let's just look at straight passive HB's for now and then maybe we will do a switched version, yes like the idea of a Rocker on the back-plate Casey, although I would suggest a Slide switch, this was going to be one of my suggestions, or possibly mounted into the battery cover plate? Well here goes, the first pic is of the 4x components that need to be removed from the board, I prefer this method to actually cutting the tracks, although I will add an image of which tracks to cut for those not able to use a soldering iron. And after removing the above 4x components you only need to add a single wire link as below, it MUST be a covered piece of wire and not just bare link wire, a thin piece of wire from some lighting flex will do the job. Its all works fine now !!!! What about the ability to blend the humbuckers and piezos in mono using the middle postion of the toggle switch? 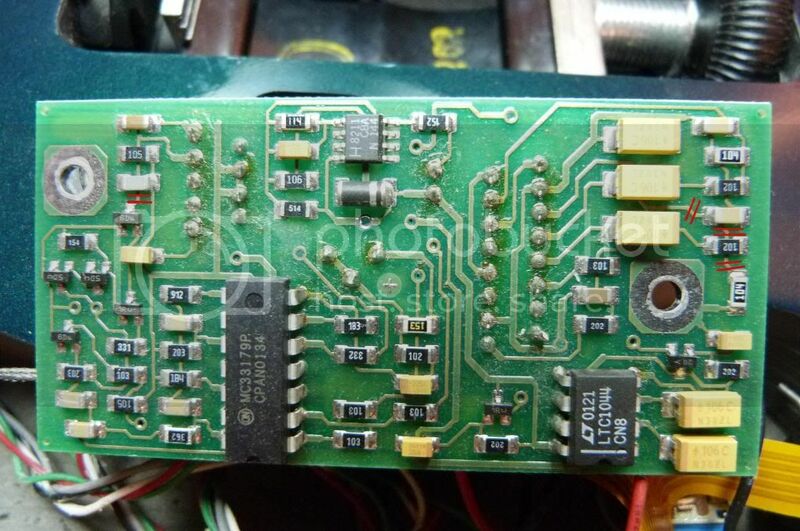 Might be possible to jumper the resistor and cap, don't cut the trace. Again, just top of head, not looking at schematic. Guys, I have been a total numpty, I forgot to switch the stereo/mono switch to mono for the Piezo, no wonder it had virtually no output, OK I am going to hang up my boots on this one tonight as it is quite late here in the UK and I will approach this with a fresh approach tomorrow. This is a great effort, so you will make many pre-ref people happy if it works. OK we have lift-off, it works [ ][ ][ ] my error was that I left R27 a 1K resistor in series with the output and this loaded the HB section to produce next to no output, but now it all works, although there are some strange switching functions but I can now say that I have the HB's working as passive pick-ups (pups) and they can be blended with the Piezo BUT ONLY if you use the Stereo cable and have the Stereo/Mono switch selected to Stereo (out position), you will obviously need an amp with 2 seperate channels to do this and the amount of control and pallete of sounds using this method is quite stunning. The passive HB's do work with a standard mono jack lead but there is no Piezo output in this mode, but the sound from the HB's is quite something used passively so check it out either way you choose. I will continue to develop this modification so as to allow hopefully a fully functional active Piezo and passive HB's with full blend control in the mono mode but for now enjoy the sound of your HB's in passive mode. Oh yes just to mention the Mastter Level pot does not function for the passive HB's, the Volume and Tone pots do however work like a conventional guitar and they work very well, as do the Piezo split Volume/Tone pots when both the above are used in the Stereo mode and using the Stereo cable. Just for the record I use a Plexi JTM45 that has 2 channels, inputs 1 & 2 of channel 1 are for the bright channel and this is used for the Piezo output, inputs 3 & 4 channel 2 are the normal channel and used for the passive HB's in the stereo mode, it works very, very well for me using this combination but may I suggest you all experiment with your own set-ups and report back here, the more feedback I recieve the happier I am. Wow, Extraordinary work. This is way above my head and for most I suspect. I would love to hear the difference in mag tone though. Maybe Parker will redesign things to allow a similar result. Your efforts are of great value to the forum and Parkerknology. Rock on ! Thank you Bill, well as you would probably guess the sound is more akin to the warm, rich tones of a conventional HB equipped guitar, I am not going to say which guitar, I will leave this to those who choose to do this mod, but for me it was worth the effort. I have a whole bunch of 70's and 80's Ibanez Artists and the modified Fly will keep up with them, also the combined bridge/neck pup position using just a single coil of each pup sounds a lot richer and more rounded, but the beauty for me is when mixed with the Piezo using 2 channels of the amp and the stereo lead, this really opens up new ground with the zing from the Piezo and the rich HB warmth that can be blended in any mix level and tone and all from the Fly. I don't get it. For $80 you can get a new Fishman Powerchip and few bucks more convert the guitar to full point to point wiring. You can sell a good old style board for double that. Then you can use real wire and mod to your hearts content.